Jamaica Tourism Minister, Hon. 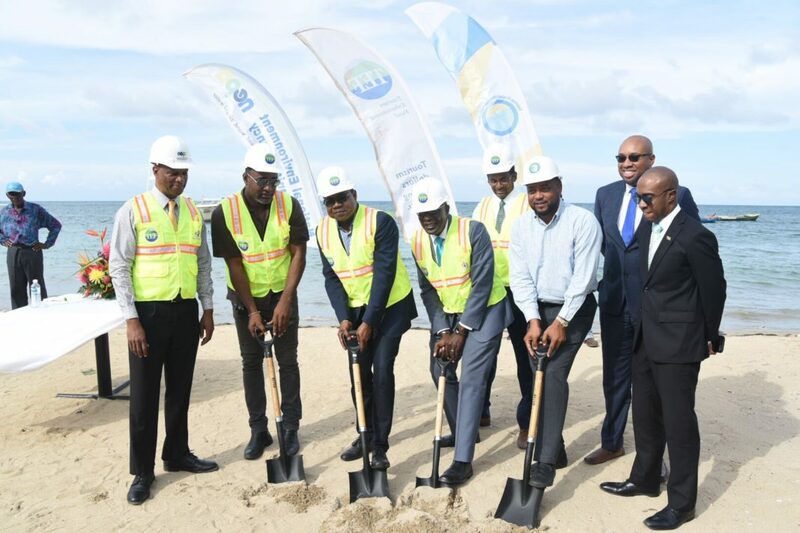 Edmund Bartlett (third left) and Minister of Education, Youth and Information Senator Ruel Reid (third right) participate in a ground breaking ceremony on October 17 for upgrades to Salem Beach in St. Ann. Sharing in the moment are (from left) Director of Environmental Management and Conservation at NEPA, Anthony McKenzie; Member of Parliament for North West St. Ann, Dr. Dayton Campbell; Executive Director of the Tourism Enhancement Fund (TEF), Dr. Carey Wallace; His Worship the Mayor, Councillor Michael Belnavis; TEF’s Communications Strategist, Delano Seiveright; and Executive Director of the Tourism Product Development Company, Dr. Andrew Spencer. The beach is being upgraded by the Tourism Enhancement Fund (TEF) to the tune of $26 million, under their National Beach Development Program. The project is expected to be completed in February of next year. Jamaica Tourism Minister, Hon. Edmund Bartlett, joined other officials in St. Ann today, for a ground-breaking ceremony at Salem Beach. The beach is being upgraded by the Tourism Enhancement Fund (TEF) to the tune of $26 million, under their National Beach Development Program. The upgrades to the beach includes the construction of two gazebos; restrooms; a wash-off stand; parking facilities; landscaping works; upgrades to the sewage treatment system; and the demolition and alterations to existing structures. “There is little doubt that this wonderful beach is one of Salem’s main attractions. By strengthening Salem Beach as a destination, we will help to improve the town’s tourism economy, diversify its offerings and thereby enhance its economic competitiveness,” said Minister Bartlett. The Tourism Minister also noted that for the 2018/19 financial year, TEF will move forward with designs for an additional 12 beaches, with construction taking place in subsequent financial years. In July of this year, the Tourism Ministry also opened the refurbished Marking Stone Beach in St. Mary, upgraded by TEF at a cost of $38.3 million. To date, the TEF has spent over $105 million on three other beaches in its Beach Development Program – Lyssons Beach in St. Thomas, to the tune of $49.6 million; Boston in Portland, at a cost of $27.8 million; and Burwood in Trelawny at approximately $28 million. The upgrades to Salem Beach in St. Ann was implemented by the Tourism Product Development Company and the property owners National Environment & Planning Agency (NEPA). The official opening ceremony will take place in the first quarter of 2019. Newer PostWould a Travel Ambassador help your business?